Thursday, September 9, 1999 - "9 o'clock"
Joooolia, the Bride as well as the Groom, with Jim, Maid-of-Honor. So I had my Groom-Optional Wedding, rented the church, rented the band, sold a spare limb to get flower wreaths, all but engraved invitations because, well, I hadn't figured out the details in time for that sort of thing. It was a pretty good crowd for a Thursday, especially since my original email announcement apparently failed to get mailed and I only discovered that 2 days before the event. I'll upload more pictures when they flatter me, ok? (And I receive permission from the various photgraphers). Radioactive for the sound equipment. Jim's Big Ego for the sound. The Unitarian Universalists for allowing Jim to speak blasphemies ("God is a Man") in their Sanctuary. Vicka for the wedding cake. (It wasn't too big after all). Kimberly for the wedding favors. Everyone who showed up and also brought food. Meg for catching the bouquet. (Heh heh heh). Sarah for not giving up after being lost for three (3) hours in Watertown, thanks to MapQuest. Karyn for the lovely *looking* bouqet. Jenny for the Useful Honeymoon Advice. We had a decent (12+ person) turn-out to see Yellow Submarine. Only two folks wanted to go to Man Ray afterwards, and since I had been wearing Blue for the Meanies, I would've had to go home and change. Most of us went to Brew Moon instead. Folks showed up slightly later than planned for the potluck and concert. Everyone else had to work that day. So, er, Meg's place, January 1st, 2001. Heh. It was 9 o'clock September 9th, 1999 for the last time in Nome, AK at 6 AM ET, September 10th. Sarah, Robert and I toasted with Gin & Tonics in the black-light room. 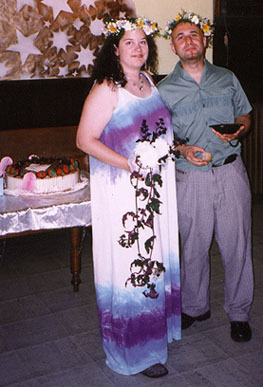 My sister, Betsy, actually got married in September of 1999. No, she wasn't even engaged when I first began seriously planning 9/9/99. She called the next day and was shocked to discover I rented a church. So... although it was not the reason behind 9/9/99, I appreciated being in the fancy dress at the country club, watching the last of my 4 siblings get married, when numerous "well-meaning" friends and relatives asked me, "When are you going to get married?" I could grin and say "I already had my wedding, thanks." Honestly though, after Betsy's wedding, I am more convinced that perhaps 9/9/99 is the only wedding I'll ever have. If I were to do a wedding that fit in with my nuclear family's collective tastes, it would be the one Betsy just had. And, well, it's now been done. More to the point, not being her, I could never have that sort of wedding. Guests quickly identified me as the rebel of the family, even before seeing the photos of 9/9/99 and Burning Man. I can rarely get myself presentable enough for a country club anymore, as I spend less and less time with people who would care. Needless to say, I couldn't get my companions to be presentable either. And while I am enough of my mother's daughter to like the Martha Stewart wedding stuff, I am just as paranoid the majority of my friends would shun me for being shallow enough to care. I noted with some alarm that the only long-haired men at Betsy's wedding were in the band or waitstaff. And my mother has already been appropriately horrified at the tie-dyed dress pictured at the top of this page. Most of my friends these days have long hair and like tie-dyed clothes. Alas. Before that wedding, I was secretly hoping I might someday have a real wedding; you know, one with a groom, and that involves my immediate family. Now, knowing I'd have to meet their preppy standards, the expectations the rest of the family has of me being a "rebel" and also something that wouldn't disgust or alienate the majority of my friends, well, I am more and more convinced that 9/9/99 was it. How long do you give this Marriage? Joelll A Medford wedding? A Somerville divorce! She'll kill herself in ten years in order to collect on the life insurance! Bait They're stuck w/ each other now!! Well, Rob R., Meg will (hopefully) be hosting what she apparently bets will be my DEATH, on 01/01/01.